We’ve noted before how we group all 1607 companies in the MSCI World Index into deciles based on various fundamental and market factors, and then observe which factors were significant in explaining performance over various time periods. What is Dr. Copper Telling Us? We track the relative performance of the cyclical sectors (consumer discretionary, financial, energy, industrial, materials, technology) compared to the counter-cyclical sectors (consumer staples, health care, telecom, utilities) to gain an insight into leadership within the equity markets. Usually copper–the metal with a Ph.D in Economics–moves in synch with the relative outperformance of the cyclicals. The NAHB Housing Market Index ticket down from 57 to 55 in October. However, the index has shown a surprisingly strong negative correlation with the Unemployment Rate (Index goes up, Unemployment rate goes down). This relationship would suggest that the unemployment rate continues to fall over the next 18 months. We’ve noted before the recent underperformance of ”defensive growth” stocks (Health Care and Consumer Staples stocks) so we thought we’d dive into the details to get a better understanding for the drivers of this relatively sudden turn in performance, since these two sectors (and Health Care in particular) have performed admirably this cycle. 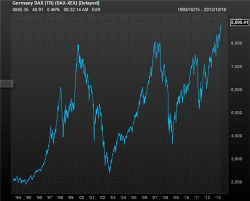 One of the tech high flyers the last few years has been Teradata, who sells software to cloud data centers. Today the target price was cut from $75 to $45 and the stocks is down almost 17%, making it the worst performer in the tech sector. Over the last month, gold companies have been among the weakest performeres in the MSCI World Index. On average they are down 9.4% over the last 30 days. 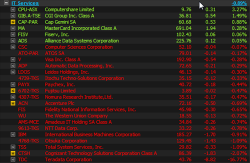 They also top our ranking for the biggest drop in 30 day relative strength. 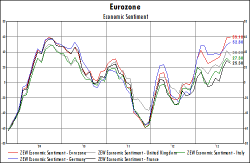 The latest data from the OECD leading indicators shows that growth in Europe seems to be gaining momentum (except for Sweden and Switzerland) while in Asia growth is below trend (except for Japan and South Korea). There has been much discussion in recent years of the leverage buildup in the Chinese corporate sector and the problems (or not) that this will (or won’t) create, so we thought we’d chime in with some quantitative data and let the reader make his or her own conclusions.